First, there is a different between a private and public beach. Stablimenti or beach clubs require you to pay anywhere from 5-10 Euro for a beach chair on their part of beach. Spiggie libere, or free beaches allow you to spread out your towel, picnic and do as your heart’s content. Often the people on the free beaches can be a bit on the vulgar side. These beaches attract large families from the provinces who seem to colonize with umbrellas, picnic tables, sports equipment. You would think they were prepared to head west on the Oregon Trail with all of the equipment they have. Unsurprisingly, I don’t particularly enjoy these beaches. From time to time, I may spread out a towel and enjoy a panino on a free beach. However, if you are on vacation on the Amalfi Coast- be civilized and treat yourself to a lettino. Otherwise you may end up with an errant beach ball to the head and screechy nonna telling you to move your beach towel over because you are in her spot! There is not such thing as a free beach when a nonna from the provincial hinerlands of Pagani is bellowing at you. Also, invest in a good pair of beach booties. Not flip-flops but actual water shoes. I know they are not particularly fashionable but on many beaches, especially the ones in Positano, you (and your feet!) will be happy for the comfort. Flip-flops can float away. And regular shoes have no place at the beach! And finally, unless you are dining at the beach club- you need to put your pants and shoes and shirts back on before dining at a restaurant. How many times I have seen foreign tourists dining in beach gear at fine restaurants including Tre Sorelle, Chez Black and Buca di Bacco on Positano’s main drag. Italian dames walk by and shake their heads only to call these naked Americans cretins. I am sure most of these cretins are generally respectable professionals in their home countries (most travelers to the Amalfi Coast are). But just put your pants back on and keep the sarong for beach time. A sarong is not a dress. Be civilized and enjoy a nice meal as God and well bread Italians intended! As you cruise to Capri from the Amalfi Coast, you may notice a little beachside village you have never heard of or seen before. This is Nerano. It sits in the crook of the Gulf of Sorrento just as it swishes into the Amalfi Coast. In the craggy recesses of Nerano, where the water is aquamarine and bathers seem ensconced in another millennium, you will find Marina del Cantone. Roman Emperor Tiberius who once had a villa for every season on Capri, often bathed at this beach. What sets this spot apart is its appealingly remote location. You can take the SITA bus here from Sant’Agata. But its best to come by car and take a 10-minute scenic footpath down to the beach through groves of olive and lemon trees. Better yet, come by boat. This is one of the best swimming holes on the Amalfi Coast. From here you can see straight across to Capri. If you really listen, you might hear the siren call of the mermaid Partenope who once dwelled at the nearby Galli Islands- that is before Rudolf Nureyev bought the islands and built his retreat there. You can arrange for boat trips with Vervece Charters. Emiliano the owner can also be reached at +39 347 984 8600. The main beach on Positano is a zoo. To be sure, many people like the carnivalesque air of the Spiaggia Grande. I, for one, do NOT. If you crave something more civilized but want to remain in Positano proper, head to Fornillo beach. There is a cobblestone path that connects the main part of Positano up past the Covo dei Saraceni hotel, along the coast and finally to Fornillo beach. This 10- minute walk is iconic and when you arrive at Fornillo beach, you can rest assured that you will experiencing Positano as God intended. Head to beach club Da Ferdinando and ask for Guido. The diminutively congenial owner will sort you out with beach chairs, drinks (they make a strangely potent mojito here) and even towels if you need them. Guido’s toy poodle Chica will provide you with jocular entertainment. Spending a day on Fornillo beach is Positano magic. For lunch, order an octopus salad at Da Ferdinando. Guido’s brother is an excellent cook. If you prefer something more substantial (that requires you to also put your pants back on!) head back up to the footpath and order the daily seafood special at Guarracino. I particularly like their seafood risotto with you guessed it, a glass of Falanghina. If you plan to hike the famous Pathway to the Gods from Agerola to Positano, then this is the beach for you. First start the hike early! What many guidebooks fail to note is that the Pathway to the Gods does not actually start/end in the center of Positano. Once you have hiked the rigorously vertical terrain of the Monti Lattari (you will go mostly downhill if you start in Agerola), you end up in Nocelle- still way above Positano. Then you must walk down 1,800 stairs, at which point your legs will almost certainly turn to jelly. And then you arrive on SS 163 Amalfi Drive—the road that connects Positano to Amalfi. It is still another 20-minute walk down this road to the center of Positano. OR- you can walk across the road, and down another set of stairs (about 50 more to go) to Arienzo Cove. This was Italian director Franco Zeffirelli’s favorite beach in all of Italy- he even built his house, now a hotel, Villa Tre Ville here. A dip in the sea here after a sweaty mountain hike is sublime. Order a Nastro Azurro and a tarallo almond biscuit at the Bagni d'Arienzo beach club. At sunset, catch the beach club’s boat back to Positano’s center and congratulate yourself for spending a perfect day in mare and montagna. 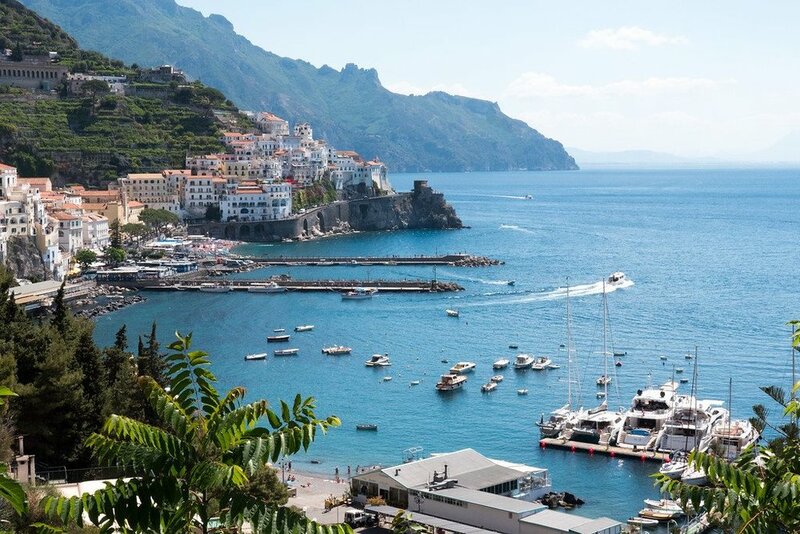 This is what makes the Amalfi Coast so special. It makes no sense to say this beach is spectacularly beautiful. Most of the beaches along the Amalfi Coast are! What sets this beach apart is my favorite beach club on all of the Amalfi Coast- Il Pirata. It is simply best. The same family has run the beach club since after WWII and their restaurant is one of the most delicious in the region. Plan to spend an entire day here. Il Pirata rents beach chairs and beds that sit on a platform right about the water. When you feel overheated, jump right into the sea. Ready for a tipple (I always am!) ask your server. Lunch here is a treat. My favorite is the sea urchin pasta (spaghetti ai ricci) and the spigola (bass). Il Pirata has everything you need to enjoy a stunningly comfortable day at the beach. I recommend taking a water taxi here if you are staying elsewhere on the coast. Rides from Positano are about 15 euro with La Sibilla Charters. Make sure to reserve a lettino (lounge chair) ahead of time in the summer months. This place is widely recognized as one of the best beach clubs on the coast. This is the beach that has been in all the movies. The iconic archway overhead gives the beach its name. When you are down here, gazing at the crystalline waters of the Amalfi, it is easy to appreciate why this beach is so telegenic. Everyone from Roberto Rosellini to Sophia Loren has bathed here and you should too. Come here for the views and stay here for a picnic. Note that you must walk down a long series of stairs to access the beach. Because this beach is tucked away in a craggy outcropping, direct sunlight generally lasts until only 5PM. Not to worry, you can head back to Locanda del Fiordo Restaurant for a memorable apertivo. A few years ago I learned to avoid the beaches in the center of Amalfi at all costs. The Smeraldino beach, which is free beach, attracted fat Agerola miscreants that would spend whole day eating panini, smoking and littering. The other main beach in Amalfi- snappily called The Beach, is too crowded and the direct sunlight is miserable. Then I discovered the Lido degli Artisti on Duoglio beach- a true paradise just a five- minute drive north of Amalfi’s center. This lido attracts a civilized crowd of water sports fanatics and food lovers. The snorkeling is excellent here. You can also rent kayaks and wind surfing equipment here. After a day of sea exploration, enjoy a meal at their beach side restaurant. Grilled prawns are my favorite. You can drive here, park your car above the beach and walk 10 minutes down or take a boat from the main beach of Amalfi. Another alternative to the cacophony of Amalfi’s main beaches is the hidden treasure that is Santa Croce beach. You can no longer get her by foot- the path has long since decayed. 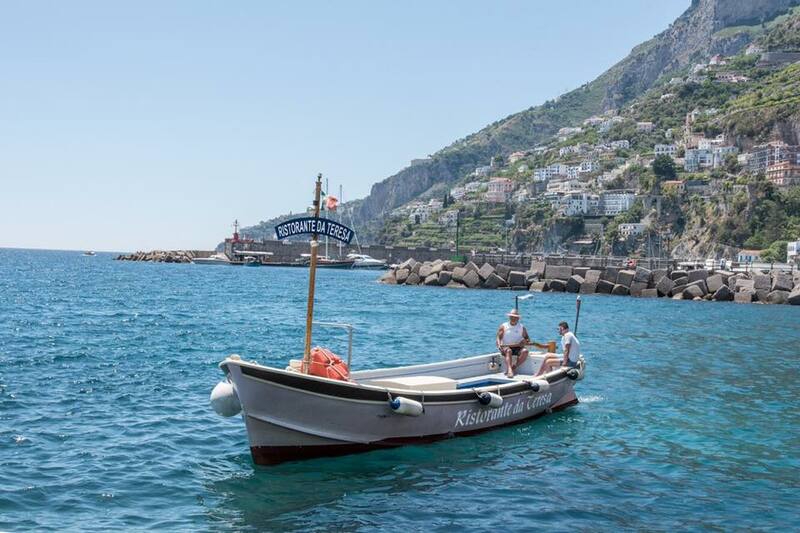 There are skiffs that depart every 15 to 30 minutes from Amalfi’s jetty that transport you to Santa Croce. The boats bear the names of the beach’s two clubs Da Teresa and Santa Croce. Whichever you take is where you will eat your lunch and spend your day. They are roughly the same price and serve the same stellar seafood so I generally take whichever boat comes first. I suppose if pressed I would say that I prefer Da Teresa and that is only because the owner is nicer. The beach itself is hidden from the tourist droves. Enjoying lunch on a coastal terrace here is a must when vacationing on the Amalfi Coast. As with the nearby Duoglio Beach- the snorkeling is excellent here. Locals also go octopus hunting here. Rest assured whatever you eat will be seasonal and fresh. Da Teresa also takes dinner reservations. Dining by candlelight in near the grottos of Santa Croce will make you promise to return here again. A lot of people say Ravello has no beach. They are wrong. Castiglione beach, just beyond Amalfi is a black sand beach south of Amalfi. It is a frazione of Ravello. Everyone from Jackie Kennedy to Wagner has bathed here. Doctors once prescribed the sand here as a cure for Rheumatism. Today just sitting on the beach and enjoying the sweeping views of Amalfi and the Cilento coasts is curative enough. You can walk down from Ravello (it takes over 30 minutes and remember you will have to walk back up) or you can take the SITA bus to Amalfi and then a second SITA bus here. My preference is to rent a kayak for the day at Duoglio or Santa Croce beach and make this a pleasant rest point. Most of the stunning beaches of Amalfi are actually coves and the stretches of beach are really rocky. Another drawback is sunlight hours. 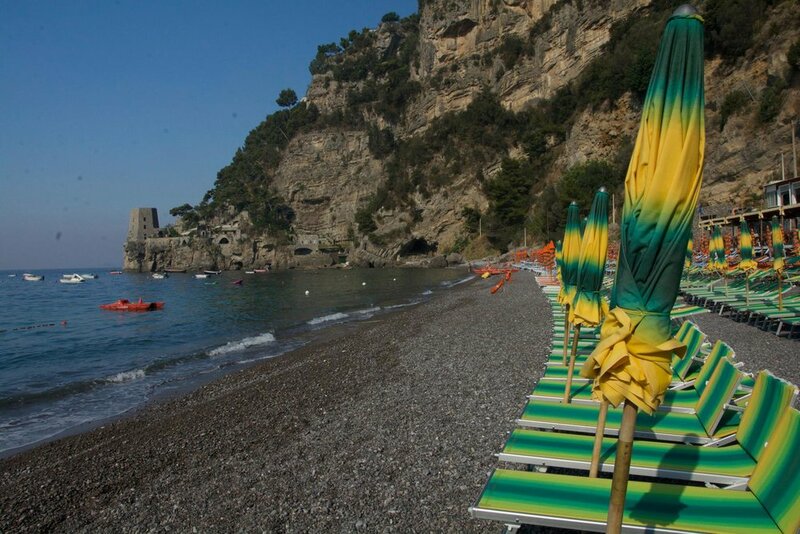 Given the spectacular mountain topography, the sunlight finishes around 5PM on most Amalfi Coast beaches. Not so with Maiori. Maiori’s main beach is wide, sandy and enjoys summer sunlight until well past 8PM. Frankly, I do not think the restaurants here are any good. I bring a mortadella and fiori di latte rosetta panino with a water bottle of Falanghina and settle for the day. While it is easy to spend a small fortune at beach clubs along the Amalfi Coast during the summer, that is unnecessary in Maiori. The beach is free and a picnic is in order. A sunset stroll along the Lungomare is the perfect end to a day at the beach. Have an aperitivo at Bar Matinee. A spritz comes with a host of snacks for five euro. 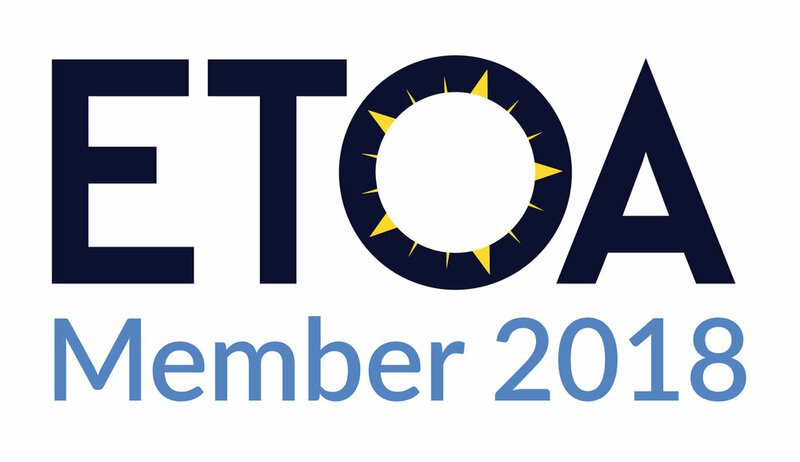 Come here by SITA bus from Amalfi or drive and park your car in one of the many garages for five euro an hour or three euro and hour forstreet parking. Nobody ever talks about Erchie, one of the southernmost towns of the Amalfi Coast. Yet it has one of the most quietly stunning beaches on the entire coast. Technically Erchie is part of Maiori. Only about 100 people live here year-round and lucky them. The main beach sits below the Torre La Cerniola, an ancient tower used to protect the Amalfi Republic from Saracen invaders. You can park your car in Erchie center and walk down to this beach. On your way you may pick up a little cuppetiello of fried calamari and fish. Douse it with lemon and you will really feel at home on the coast. There are two smaller beaches that require a bit more work to access but are well worth the effort. The first hidden beach is Sgarrupo and the second is Limoni. Both are accessible by boat from the main beach on Erchie which costs 3 euro per person per ride. If you want escape the coastal bustle and discover a sliver of life unlike any other here, come to Erchie. Cetara at the height of summer. Cetara, the penultimate town of the Amalfi Coast, is most famous for its fermented anchovy sauce, colatura. In fact, one of the reasons to visit Cetara’s beach is to work up and appetite so you can eat its various seafood specialties. The best anchovies on the coast from here. Spend a day sunning and swimming and then go to Ristorante Acquapazza for lunch. Order the spaghetti with colatura and Acquapazza style branzino cooked with local tomatoes, garlic and parsley. Go back to the beach after lunch. It is steps away, and despite what Italian nonnas tell you, you will not DIE if you go in the water after lunch.